Just like everyone else who came in contact with him, April Martin was enamored with Austin Li. The martial arts instructor's engaging personality made him popular with his students, and their parents. Particularly the women. But April had a plan. Although it was frowned upon for instructors to date students, April signed up for private lessons with Austin. Hopefully, the time alone would give her the advantage and although she might lose to him as an opponent in martial arts, she might still win his heart. Martial Hearts tells the story of a woman finding courage to face the man she loves. It was a sweet story, and I enjoyed watching her slowly gather the nerve she needed. 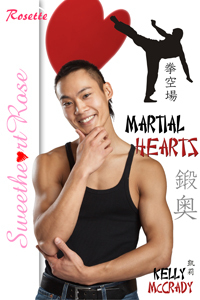 However, there was a bit too much focus on the martial arts than on the romance. Also, I really don't see why an adult martial arts instructor would not be allowed to date an adult student.